Last year I told you about the Parrot Bebop, my favorite drone for someone looking for good quality images but for less than $500. Parrot just launched the $599 Parrot Bebop 2, a refreshed take on the original Bebop 1. The Bebop 2 will be available to the public on Dec. 14, but Parrot let me give it a whirl ahead of time. Buy it on B&H Photo for $599. Buy it on Amazon.com for $599. The drone is mostly the same as the Bebop 1 but with technological improvements — an impressive 25 minutes of battery life — pretty much doubling the flight time of its predecessor. The drone is easy to fly — able to maintain altitude and is easy enough for a kid to control. But it’s also a little more hoppy than counterparts like the smooth (and for some, arguably too slow) Yuneec Typhoon which could provide a layer of excitement for someone who finds joy in maneuvering the copter while in flight rather than just getting video footage. I love the Bebop for taking on a vacation – at less than 18 ounces (about the weight of one and a half cans of coke), it’s incredibly light. But’s it’s powerful enough to fly at 37 mph horizontally, or 13 mph vertically. That means it takes less than 20 seconds to hit 328 feet. And the video quality is solid — a fish-eye camera digitally stabilizes the HD video on a 3-axis framework, a type of digital gimbal. What really sets this drone apart from others is the attention to detail that turns minor problems into problem at all. The drone comes with spare propellers that are easy to screw on, and the battery charger comes packaged with a variety of mounts that fit other country’s outlets. It’s probably a good business move so the drone can be sold around the world, but it’s also a good move for what I think is Parrot’s best use case — as a drone to bring on vacation. My one love/hate relationship qualm with both the Bebop 2 and its predecessor is how you control it with your smart phone. All you need with you to operate the Bebop is the drone itself and your smartphone, which you likely have on you anyway. 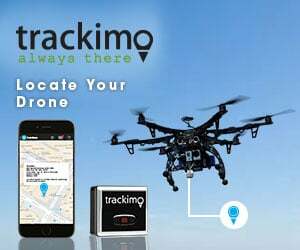 It’s pretty cool how you can control the drone with either your fingers or by tilting the smart phone to indicate the direction, and the drone follows. A simple landing button automatically lands the drone. It also means less “stuff” you need to bring with you when flying. But using an external device also makes me reliant on another company’s products in order to use my Bebop drone. One flight, I just couldn’t start up my drone because it was having trouble connecting to my phone. You also fall victim to problems with your Smart Phone — my iPhone recently is at the stage in its life where the battery simply shuts off when it reaches 50% charge. Although my iPhone problems aren’t Parrot’s fault, it’s not all to too convenient if I’m flying my drone and my phone battery starts to hover in the 50% range. Because of concerns like that, Parrot also introduced an RC transmitter called the SkyController, so users technically wouldn’t need their phone, unless they were looking to watch live video. Though I love the concept of the SkyController — it allows for much more precise control of the drone’s movements than an iPhone allows, enables extended Wi-Fi range and also connects via HDMI for FPV goggles — it’s bulky and heavy compared to competing RC transmitters from companies like DJI. And with a controller unit so big, it’s the antithesis to the charm of being able to control the drone from a tiny phone. It also puts a heavy price tag (the SkyController is an additional $399 when purchased separately or the Bebop 2 and SkyController cost $800 together) on the drone that negates the Bebop’s value factor. I do think the SkyController would be worth it if it offered a live stream of video directly on the device to completely remove the need for the iPhone. But since that’s not the case, I would not recommend buying the SkyController. At $599, it’s easy to choose a Parrot over a $699 DJI Phantom 3 Standard if you’re looking for a gift for a casual drone user. If you want an easy and safe to fly drone that offers high quality video, but your budget is in the $500 range (and strictly under $600), Parrot’s Bebop is a delightful no-brainer. But if you can afford to up your budget by a couple hundred dollars, it’s certainly worth it in the long run to consider competitors because of better control and video quality. I love that the Bebop 2 offers drone pilots the best of both worlds in terms of acting as a toy or a “real” drone. It’s light and safe — I would feel good about gifting it to a teenager (or *ahem* non-manual reading adult). It’s half the size of a Phantom or Typhoon, so it’s a great gift for someone new to drones. But unlike a lot of “cheap” drones on the market, Parrot’s Bebop 2 provides high-quality video that will satisfy any pilot looking to document their homes, BBQs or vacations. I have been really considering the bebop 2 when it comes out.. I’m looking for a drone that can handle a decent amount of wind (20 mph) has a decent camera, can possibly fly indoors and is not made by dji. Not considering price, would you recommend the bebop 2 over the q500? Have you reviewed the skycontroller 2 that comes with the Bebop 2 FPV kit. If so, how did it compare with the big huge skycontroller and did you like it. The Parrot Bebop is still an excellent choice in this price range, with pretty decent battery life. I’d say one of the cons is the range, which will vary depending on line of sight. Like the article mentions, the range can be extended with the SkyController. The other thing to mention is that when you do lose your wifi signal, you cannot send a return to home command. The Parrot will simply hover in place until the battery is used up. Another thing to remember with the return to home feature that there is no collision avoidance built in, so make sure you have clear flight path if possible.